ACAT building. ANU Campus 1994. A corner of the ACAT open workspace lab. 1994. 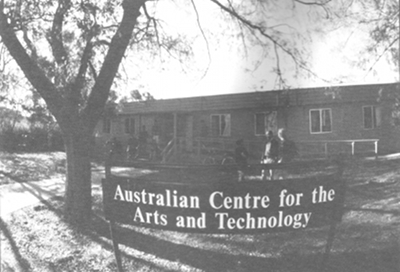 The Australian Centre for the Arts and Technology (ACAT) was established in 1989 at the Institute of the Arts, Australian National University, with David Worrall as its founding Director. ACAT operated until 2003. The Handbook pages are reproduced here as a public record of the Centre's highly successful educational program, widely considered to be both innovative and representative of world best practice at the time. This material is the Institute's Handbook entries for ACAT's Courses and Unit Outlines for the year 1994. The 1994 Handbook was chosen because it contained both texts and references, a practice later disbanded in favour of short descriptions that were supplemented with detailed handouts to students enrolled in particular units. 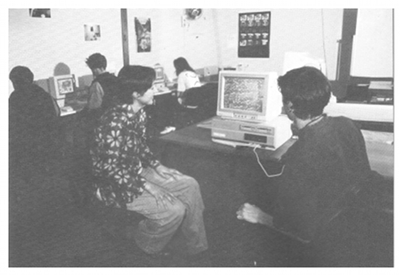 A short Studio Report, presented to the 1995 Australian Computer Music Conference, provides some more of the details of the Centre, including the broad educational philosophy and the facilities available at the time. Also available here are course and unit outlines for the Bachelor of Music degree in composition at the School of Music, Australian National University, which contain a substantial number of ACAT units. The Australian Centre for the Arts and Technology is a centre for the teaching, research, recording and publishing of music and dynamic visual art made with new technology. The centre is the first of its type in Australia and maintains links with similar centres around the world. It provides a unique environment for the study, research and artistic use of computers and is a focus for the multidisciplinary education of composers and visual artists interested in using new technologies as expressive tools. ACAT is a constituent of the ANU Centre for Information Science Research (CISR). Students in the latter years of their course participate in the various projects being undertaken at the centre and are guided progressively into undertaking their own research. Currently research is in the areas of sound synthesis and analysis, digital signal processing, music and dynamic image composition, software and hardware development, geometric modelling and animation and realtime performance of both music and graphics with computers. Music and Visual Art students are encouraged to undertake joint projects where applicable. The aim of this course is to provide an opportunity for candidates to undertake research and development on some aspect of the electronic arts at a postgraduate level. The course is designed for highly motivated individuals who wish to further develop their creative and technical expertise in computer music and related digital audio signal processing, computer animation and other electronic imaging, or some mixed-media combination of these fields for fine arts, commercial or scientific perceptualisation purposes. The course is intended for those candidates wishing to specialise in the electronic arts either for artistic/aesthetic, technical or perceptualisation purposes. As this field of study is interdisciplinary it may be appropriate for candidates to access supervision and other expertise from more than one of the ANU's Graduate Programs. The degree has been developed as a Master's course by coursework and research, according to the ANU Degree of Master (Coursework and Research Course) Rules. 'Coursework' is defined as a unit of study taught either by means of a series of classes or by means of practical work, including individual lessons, masterclasses, laboratory work, etc., or the production by candidates of reviews of literature, essays, performance works, or the attendance at and participation in seminars. The course is offered full-time or part-time, extending over not less than one year and not more than two years full-time and not less than two years and not more than four years part-time. Applicants seeking admission to the Master of Arts (Electronic Arts) must hold at least a Bachelor's degree with Honours at the standard of at least second-class Honours (Division A) or an appropriate Graduate Diploma, Master Qualifying course, or an M.Litt. Appropriate Graduate Diplomas include those in Music, Art or Electronic Arts or some other discipline related to the proposed course of study. For administrative purposes, ACAT's graduate courses are administered through the Graduate Program in Music. The structure of the M.A. (EA) course has been designed to allow maximum flexibility so that the course components, coursework and research, may be tailored to a student's individual needs both in terms of content and relative weightings. Students must nominate the relative weighting of the course components at the commencement of the course. The proportion of coursework in visual, sonic or mixed media and the proportion of research, must be finalised no later than six months after the commencement of the course. Significant variations to the study program and mode of assessment must be approved by the Prescribed Authority, following the recommendation of the candidate's supervisors, and will not be accepted less than six months before the date of examination. The individual course components and requirements for assessment in each of these areas are outlined below. 80% A folio of original work, including at least one of a substantial and sustained nature commensurate with the weighting of this component of the course. 20% A sub-thesis of 8,000-10,000 words. And: A 'Work in Progress' report to the Graduate Seminar. 70% A folio of original work, including at least one of a substantial and sustained nature commensurate with the weighting of this component of the course. 30% A sub-thesis of 10,000-12,500 words And: One paper, undertaken in such semester work as may be prescribed or approved in each individual case. 60% A folio of original work, including at least one of a substantial and sustained nature commensurate with the weighting of this component of the course. 40% A sub-thesis of 12,500-15,000 words And: One paper, undertaken in such semester work as may be prescribed or approved in each individual case. 50% A folio of original work, including at least one of a substantial and sustained nature commensurate with the weighting of this component of the course. 50% A sub-thesis of 15,000-20,000 words And: One paper, undertaken in such semester work as may be prescribed or approved in each individual case. (1) Folio work is defined as any work that is not in the form of written text. It may include such things as audio tape, video tape, photographs, sound sculptures, event documentation and score manuscripts. (2) It is expected that all candidates will present at least one progress report on their work to a Graduate Seminar. (c) submit a folio of recent work which in their opinion would assist the panel in its deliberations. The Prescribed Authority may also require an intending candidate to undertake additional tests or interviews and may seek additional information about the candidate, as is considered necessary to determine the applicant's suitability for the course. Candidates for the Master's degree will be supervised by staff relevant to their field of study. Arrangements for the selection of supervisors will be developed within the Graduate School and submitted by the Prescribed Authority for approval. In accordance with the Degree of Master (Coursework and Research Course) Rules, Part 11 3A, students undertaking a Graduate Diploma may seek a transfer of enrolment from the Graduate Diploma (Electronic Arts) or from other appropriate Graduate Diplomas to the Master of Arts (Electronic Arts). The commencement of that person's course for that Diploma will be treated as the commencement of that person's course for the Degree, and the candidate will be granted status in relation to the Degree for as much work undertaken for the Graduate Diploma, as the Prescribed Authority determines. Eligibility for transfer will depend upon successful completion of all coursework requirements at the level of merit or above. Examinations for the Master of Arts (Electronic Arts) will be conducted in accordance with the ANU's Degree of Master (Coursework and Research Course) Rules. Aims and objectives: This one-year course provides training, by coursework, in the use of new digital sound or image technologies for artistic, commercial or scientific perceptualisation purposes. In addition to some specifically graduate work, it condenses the animation and music units relevant to the arts and technology of ITA's Bachelor of Arts (Visual) and Bachelor of Music (Composition) degrees into a single year of concentrated study It would thus be inappropriate for ITA graduates holding these degrees with specialisation in either composition or computer animation to undertake this course. It would, however, be suitable for graduates from ITA music and visual arts degrees with majors in other areas who wish to gain expertise in the electronic arts. –is not available for interview before being accepted into another course (an overseas applicant, for example). Admission requirements: Applicants to the course will normally be expected to have completed an undergraduate qualification and be able to demonstrate creative, analytical and critical skills appropriate to the objectives of the course. Professional experience and standing in the field may be taken as equivalent qualification for admission. There is no provision for advanced standing. Application is to be made on the form provided and must be accompanied by evidence of meeting the admission requirements. An admissions panel will review applications and may recommend a requirement of other specific preliminary or concurrent study it deems necessary. Concurrent studies cannot be undertaken without prior approval, nor can a full-time candidate undertake concurrent full-time employment. Assessment: Upon acceptance into the course a candidate will be assigned a supervisor whose role is to provide guidance and advice on the candidate's progress in the course. As this diploma is by coursework, candidates will be required to present material for assessment as outlined in the individual units of the course. It is necessary to pass all units to be eligible for admission to the diploma which will be graded at a pass, merit or distinction. The result achieved will not be just a summation of grades but will contain an overall judgment of performance in the course. A pass with distinction will be awarded to candidates whose work fulfills all the requirements of the course to a high level of competence and demonstrates a high level of imaginative development and innovation. A pass with credit Will be awarded to candidates whose work demonstrates both a level of competence significantly beyond the minimum requirements and a significant recognition of the challenges of the course. A pass will be awarded to candidates whose work satisfactorily fulfils the minimum requirements of the course and which demonstrates an acceptable level of technical competence. Study program: The study program for the Grad.Dip. E.A. appears below. Whilst many of the units as outlined are quite technical, an underlying principle of the course is the development of aesthetic sensibilities together with technique. This principle ensures that in the teaching the presentation of the material is moderated by artistic rather than purely computational concerns. Specific content and text details as outlined are subject to change. It is advisable to contact the relevant staff before purchasing any materials for the course. The Australian Centre for the Arts and Technology, through the Canberra School of Music, offers an advanced course in computer music for the person who has already achieved a high level of technical and musical skill, leading to a Graduate Diploma in Music. This diploma, the first of its kind in Australia, has been oftered since 1987. The areas of study will vary from student to student and the study program for each student will be decided in consultation between the student and the Co-ordinator and presented to the Board of Studies for approval. The Board will appoint a supervisor for the student's program. –can show considerable experience and distinction in music composition. Composition: Applicants are required to submit a folio of compositions and any other materials (for example software design details) which may help with their application. Interview: Applicants are required to submit their application a brief statement setting out the studies which they propose to undertake during the course and to be prepared to discuss their proposal during an interview. Additional tests and information: The School ma require an applicant to undertake additional tests, y and may seek additional information about the applicant to enable it to determine the applicant's suitability for the course. The School may require an applicant to undertake additional studies in a specific area. Admission to the course is conditional on the successful completion of those studies. Contact time: Under normal circumstances there will be an average contact of three hours per week for tuition. However, the arrangement of that time will depend on the student's study program. Composition: The student will be required to compose and publicly present two substantial compositions. Analysis: The student will be required to analyse two compositions (one of which is the student's own) which use computers. Literature Review: The student will be required to become familiar with the most recent trends in computing, psychoacoustics, timbral analysis, and synthesis techniques as they apply to music. Composition: The two substantial compositions and their public presentation will be formally assessed. Analysis: The two analyses, each of which is not less than 3,000 words or equivalent, will be assessed by a panel of which at least one member has expertise in the topic, presented. Literature Review: Evidence of familiarity with current trends will be assessed on the presentation of a summary of the literature that has been read. To be eligible for the award a candidate must pass in all three sections of the course: Composition, Analysis, and Literature Review. The overall assessment for a successful candidate will be graded as 'Pass', 'Pass with Merit' or 'Pass with Distinction'. As students will be required to implement the sound component of their works, applicants are encouraged to address this in their Study Proposal. Applicants should discuss their Study Proposals with ACAT academic staff before they submit their application. Prerequisites: Prospective applicants are normally expected to have an undergraduate degree or other equivalent qualifications or experience. The interdisciplinary nature of computer animation demands a wide range of skills in both the arts and the sciences. As the current specialisation of most undergraduate degrees precludes such diversity, graduate students will have the opportunity to audit undergraduate units taught within ACAT, and may be advised to do so. Course content: The one unit in the course is Studio Practice, but the content will vary for individual students.